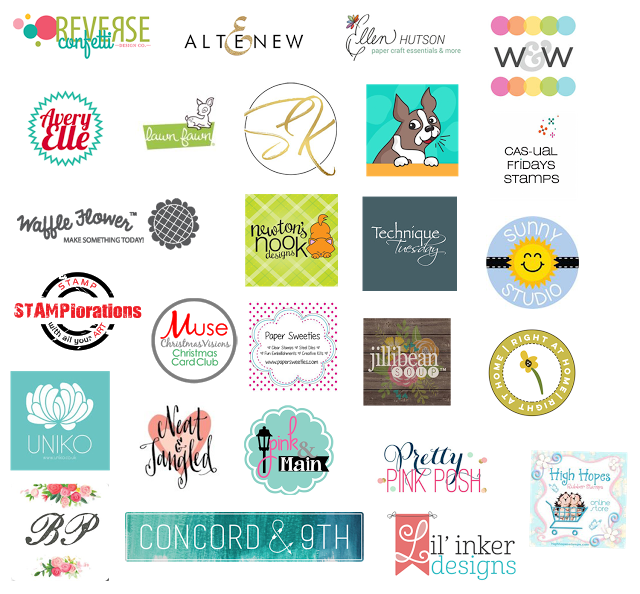 Welcome to Day 17, if you are just arriving for the first time all the details and the linkup can be found HERE! 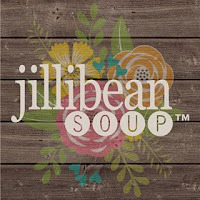 Today I am excited to have Jillibean Soup as both a sponsor and guest today! They are offering a shaker tag bundle to one lucky winner! That white Christmas flower shaker with the black and red centre has caught my attention today. Guess that's my inspiration sorted! Love love love love these!!!!!!!!!!!! What an awesome prize for today, the dt cards are fabulous. so many fantastic ideas. the little shakers are adorable. 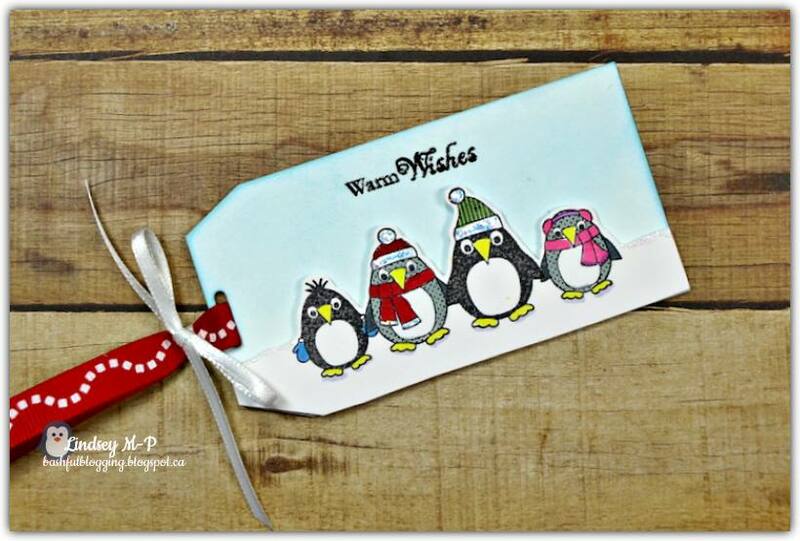 Lindsey's penguins are so cute and gorgeous sponging on Tracey's tag. I'm in love with the snowglobe snowfamily tag too. Fabulous shaker tags. 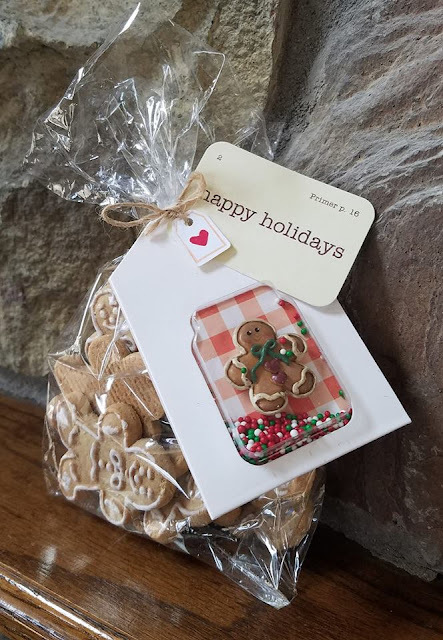 How cute is a Gingerbread Man tag and your background. Love it. 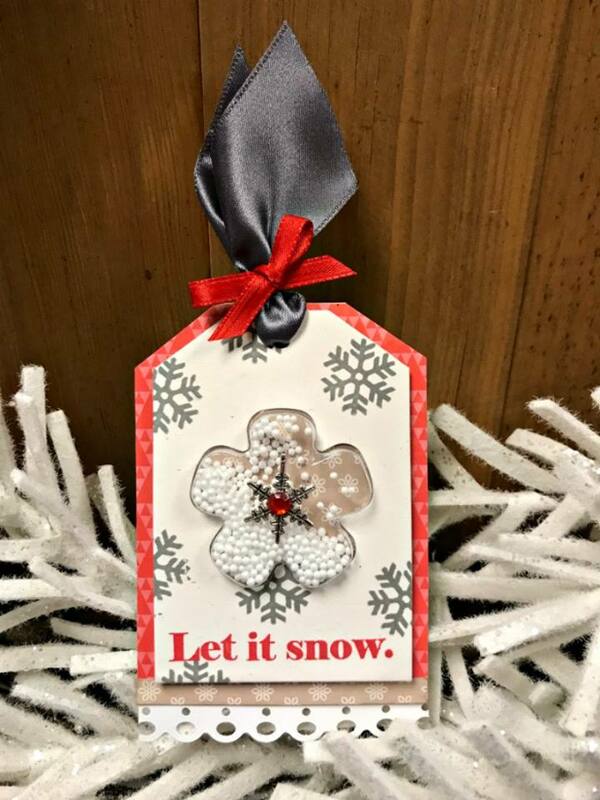 Your tag is so pretty Tracey - who is going to notice the gift it is attached to?!! 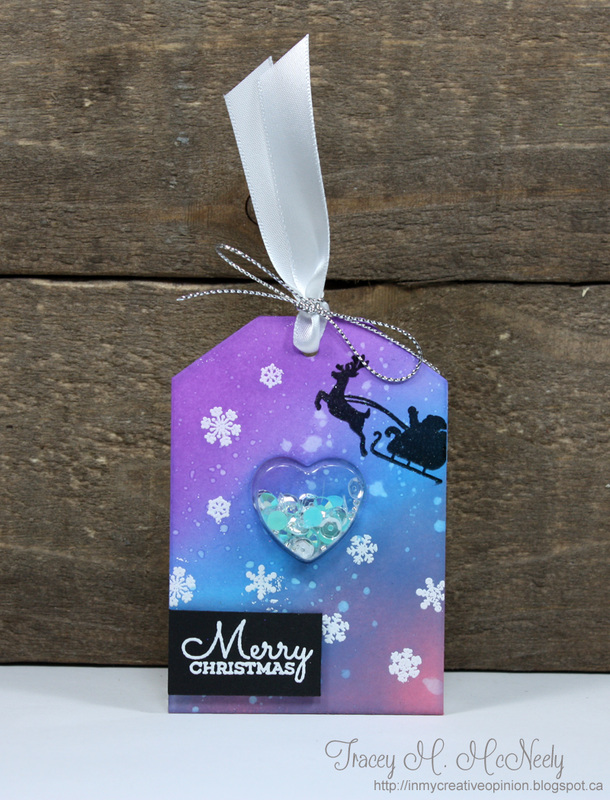 I love the contrast of the black Santa sleigh silhouette against your pretty purple and blue sky and the petite heart pouch filled with tiny sequins and other embellies. Love all of the sparkles! Beautiful tags. Tracey I love the color combination in your tag. Yay! Another new company for me to check out. I don't have any Jillibean Soup products but sure do like what I see from the tags on your post. I like you starry night sky with the cute heart shaker! 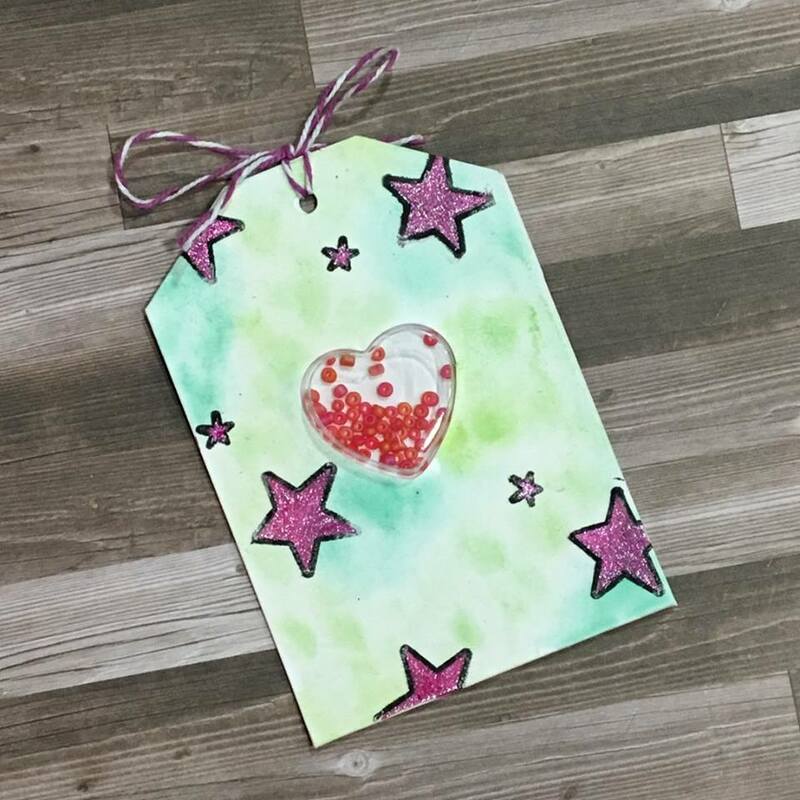 How sweet are these tags from the Jillbean team! The shaker elements certainly have me intrigued! Love them all! 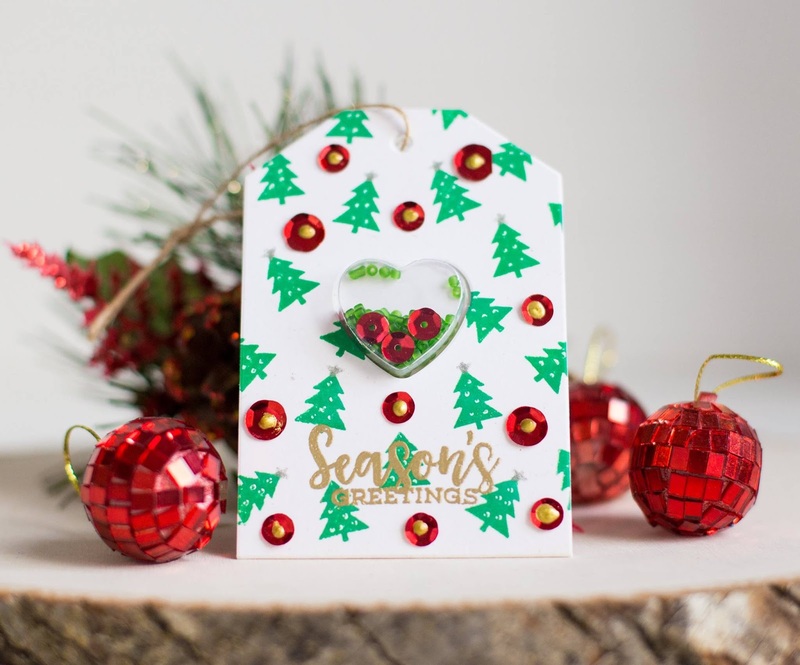 Your little Santa/heart combination is delightfully magical! Wow, love all the variations on the shakers. Tracey, the colors and blending on your tag is gorgeous. Well I'm late to the party, but better late than never. Your 25 days is perfect for me this year since I've been creating neighbor gifts. 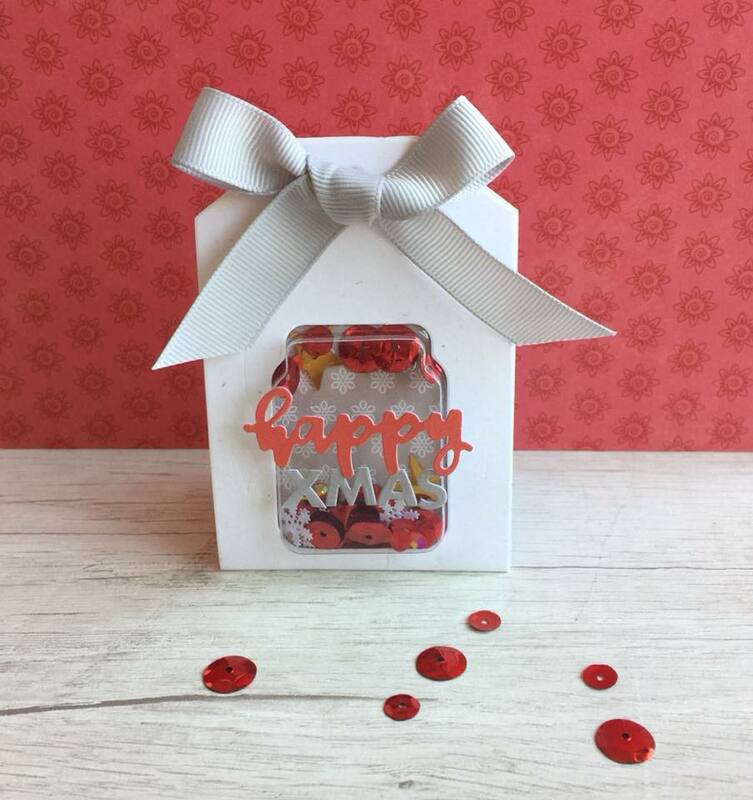 I'm going to create tags for the gifts based on inspiration from your event. Talk about perfect timing! Thanks for this huge event, Tracey and co.
Wow--what a wonderful prize & what a great variety of tags today! I really love Kimber's simple use of red & green papers--not even Christmas, per se! I love those little shaker compartments and the fun ideas everyone had! Wonderful tags! 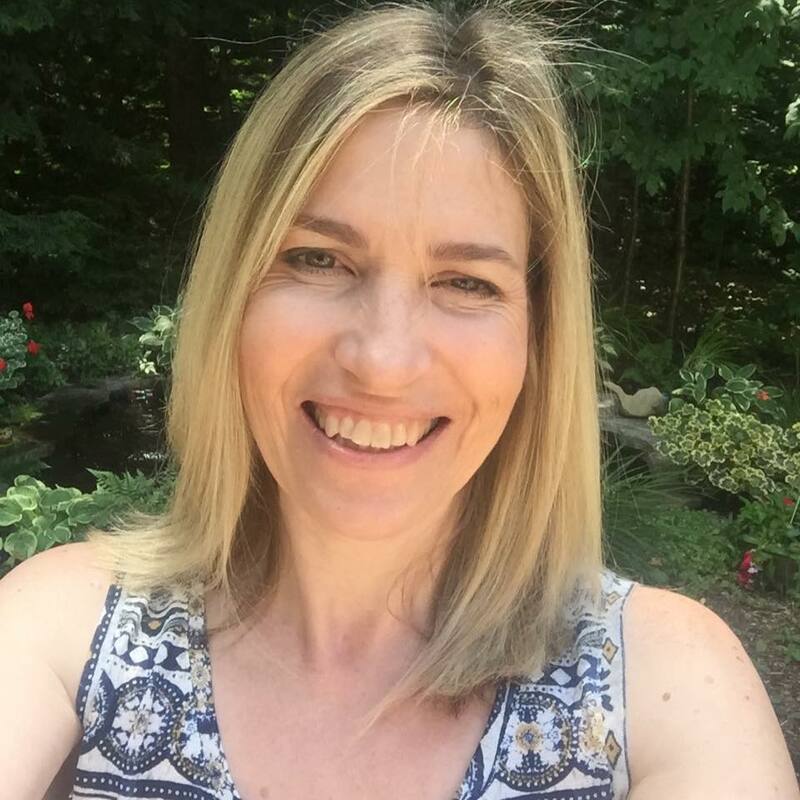 I love your blue and purple night sky, Tracey! Cute tags. My faves are Jenifer's gingerbread tag and Kristine's rolled tree tag. So many fun creations! I think Tracey's is my favorite. The colorful background is gorgeous! Your tag is so cute, Tracey. 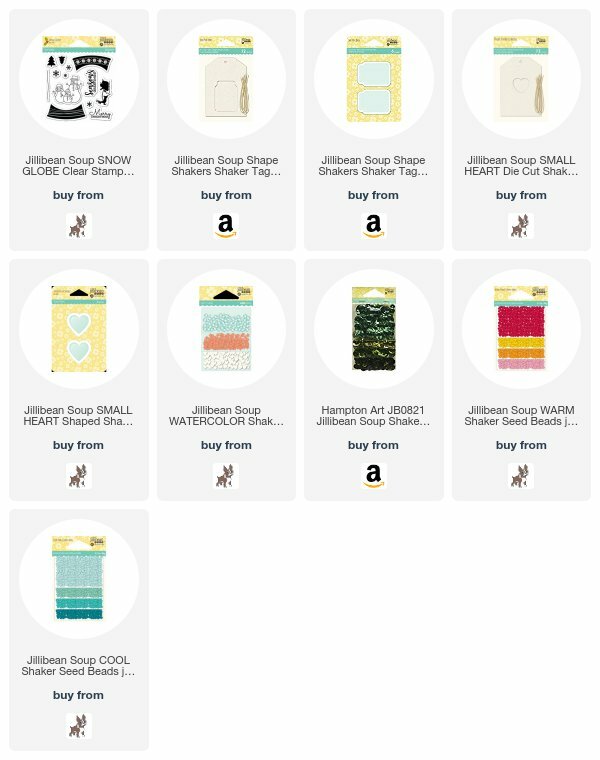 I'm such a JilliBean Soup lover, and I recently purchased those heart tags and shakers. 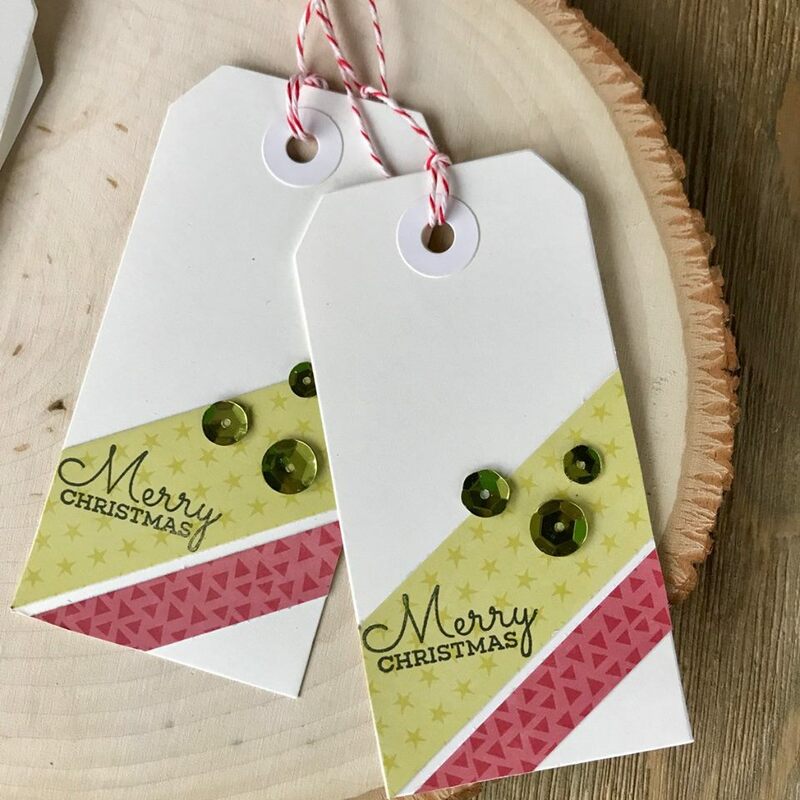 I hadn't thought about using them on a Christmas tag, but now I'm definitely going to give it a try. I'm inspired again! I can't say thank you enough times for all you've done here. Fun and sweet. 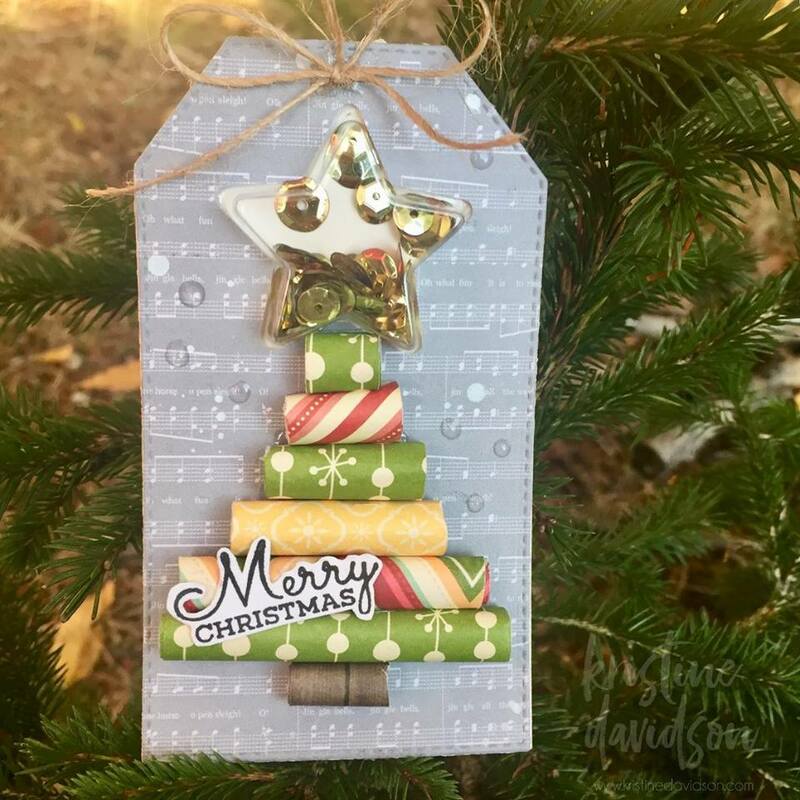 Love the cute little shakers and the simplicity of the tag with the diagonal stripes. Another day of marvelous tags. My fave is Jaclyn's Peace, Joy and Love tag. So much creativity. Love the Christmas tree shaker. Thanks for the inspiration. Oh so fun and sweet, especially love those shaker in the heart! Oh wow I love those cute shakers! Gorgeous tags. I thought they just designed paper - so I've learnt something knew! Oh, these shaker tags are super cute! Great shapes for the little shaker containers! Love, love, love them! 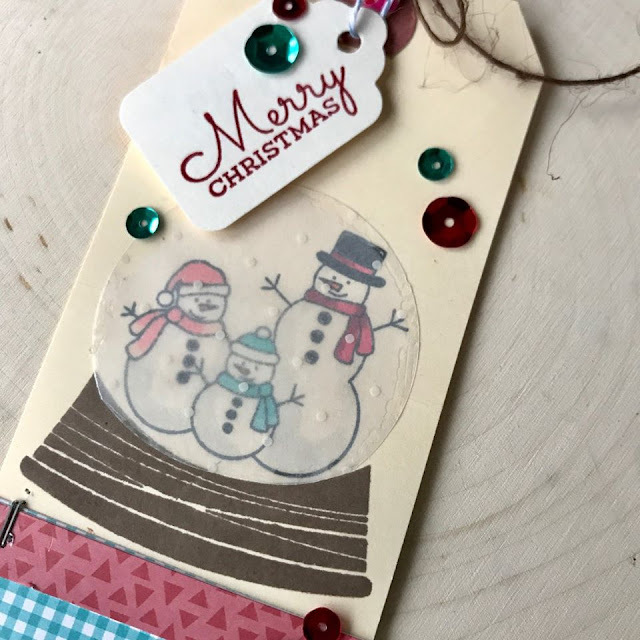 I love these adorable shaker tags, especially the gingerbread boy design by Jenifer. These are so fun!! Tracey, your tag is just amazing !! This is a true miniature card ! Wow! Wow! Wow!!! I'm inspired by all the AWESOME set of shaker tags!!! They're all so beautiful!!! So different and unique creations with such fun! Love the silhouette impact of the image with cute heart shaker one on ur tag! Your night sky is gorgeous Tracey! So much fun! Looks like their kits make for quick and easy shakers! The designers have knocked it out of the park! I love all the fun tags. Great job designers! I had never seen those adorable shaker in all those shapes and perfect sizes for tags, they are all awesome! I just love Jillibean Soup! Their shaker products are the latest wow in their lineup of goodies. Awesome tags shared here! Such cute tags! Those shaker elements are so cute, especially the jar. Love the background on your cute tag too. Love your tag, Tracey, and Kimber's clean and simple ... both caught my eye. Shakers are my favorites!!! I am in total heaven today!!! 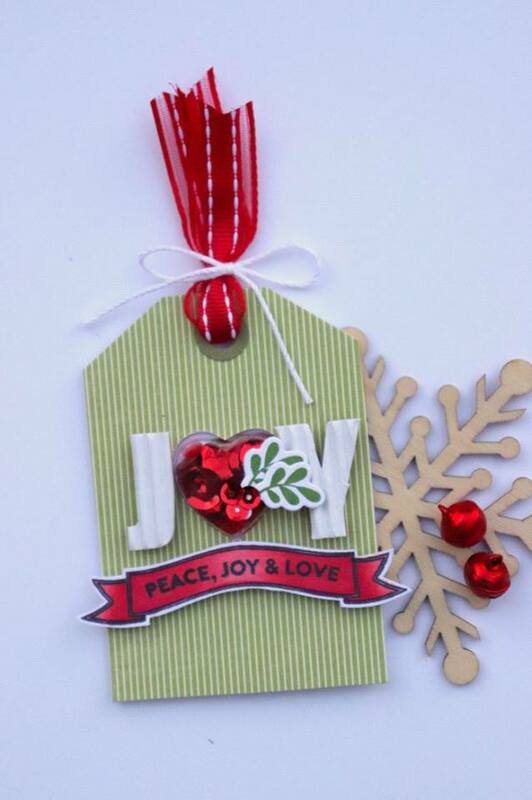 Love all the shaker tag ideas... so fun! Love the tags today. Thanks for posting them. I love the Tracey tag today, love the background, the Santa and that heart is just perfect, love right in the center! 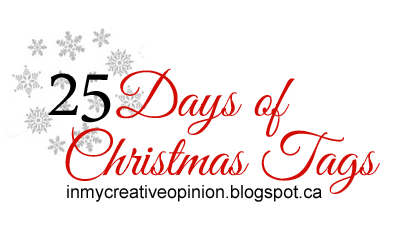 I love Kristine's rolled paper Christmas tree and want to try to make one of those!! how clever making the snow globe with velum. The tiny dimensional shakers are so adorable! And I love Kristine's rolled papers tree--so clever! Rebecca's traditional color combination stole my heart today, so I chose to create a shaped tag with the same colors! 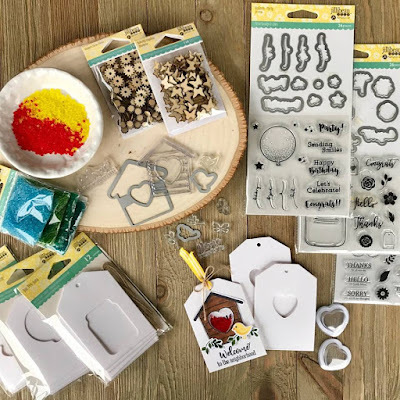 I love all the shaker tags and the shape shakers that I'm sure makes them a cinch to make. The shaker tags are so cool. Love them all. Beautiful and sweet tags, i found many inspirational tags! these are cool! especially liked the one by Patty, sooo pretty! Oh WOW that's so awesome. That tiny little shaker element is so fun! I love all the shaker tags so much! What darling elements! So many great ideas from my past mixed with amazing new things. A match made in Heaven. omgosh!!! stomping feet - not gonna pick just one!!! the tiny little detail of the shakers!!!! So cute! Love the tags. I really like the design of Kimbers simple tags. Great for mass production and using up all the scraps of paper. Wow, all of these are so pretty and I love the dimension on many of them. I’m blown away by the rolled paper tree Tag by Kristine D., and the five others with the dimensional shaker windows. Very cute! Thanks for the inspiration! I was inspired by all of the shaker tags to make one for myself! amazing tags, I love shaker elements!